Issues of political and moral choice and commitment and of literary theory and practice are considered in the South African Nobel laureate’s fourth collection of criticism. Gathered here are 16 book reviews, four summary “introductions” to new translations or editions of major writers’ works and a single celebration of a “classic” film (“Arthur Miller, The Misfits”), which appeared in the anthology Writers at the Movies. Coetzee’s great strength is his sure sense of form—notably displayed in a meticulous deconstruction of Philip Roth’s “dystopian” alternate-history novel The Plot Against America and a stringent explication of enfolded levels of irony and self-deception in Coetzee’s countrywoman Nadine Gordimer’s subtle political novel The Pickup. He also does his homework, assiduously. A wealth of painstakingly absorbed historical and biographical information enriches his dissections of scholar-critic Walter Benjamin’s “the Arcades Project” (an encyclopedic analysis of Parisian social life “under capitalism”); Günter Grass’s challenging historical novel Crabwalk (based on a maritime disaster which has spawned numerous conflicting treatments of its details and significance); and the recently rediscovered fiction of 20th-century Hungarian author Sándor Márai, both a bold critic of fascism and a haughty apologist for an embattled aristocracy. Elsewhere, Coetzee pays due (if predictable) tribute to consensus European masters (Robert Musil, Paul Celan, Italo Svevo) and their less celebrated peers (Bruno Schulz, Joseph Roth, Hugo Claus), fellow Nobelists (Faulkner, Bellow, Naipaul), the underrated (Swiss miniaturist Robert Walser) and the unclassifiable (eclectic memoirist W.G. Sebald). Even middling essays on Whitman, Beckett and Graham Greene are redeemed by startlingly precise insights (e.g., that Greene’s “entertainment” Brighton Rock is energized by distinctions drawn between Good and Evil and Right and Wrong). 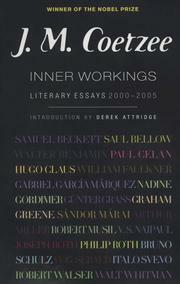 Dare we suggest that Coetzee is actually a better critical essayist than a novelist? This trenchant, rewarding volume suggests it just may be so.